I am delighted to join you all on this good evening, delighted indeed to be here celebrating French National Day with all of you. Allow me to begin with culture - the culture of sport. To thank France for giving football fans in Hong Kong, and all over the world, a blessed, brim-full month of the beautiful game. Yes, Euro 2016, live from France, night after night. Well, here in Hong Kong, it was more like late night and early morning after late night and early morning. And my panda eyes for a week are true testament of my devotion to this beautiful sport. If the results, for some, did not quite meet expectations, the games themselves gave us brilliant sport, spectacular displays and so much more. They brought together the fans; they brought together the peoples of not just Europe, but all around the globe. They united a world in passionate conversation, ecstatic celebration, momentary agony and abiding hope for tomorrow. For that, we are grateful - to the game, and to France, for your courageous play and its splendid organisation. Hong Kong and France, to be sure, come together in a good many ways beyond our shared love of football. This evening, we are here to acknowledge, we are here also to celebrate, our long and enduring ties. In many ways, our relations have never been stronger. Never more promising. Earlier this year, the French newsweekly Le Point called Hong Kong "the new French village", and I think the presence of the people here demonstrate the very fact, noting that the growing French community here appreciates "Hong Kong's many advantages for doing business, the lack of red tape, the feeling that anything is possible". They love, as well, Hong Kong's "shops and restaurants, and the quality of life" that prevails here. 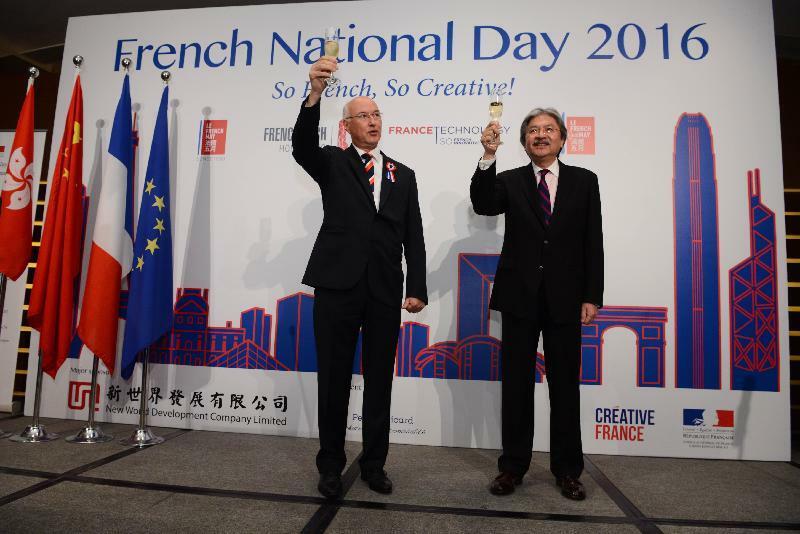 Of course, their very presence - more than 12,000 French nationals are registered officially with the Consulate - adds superbly to Hong Kong's business acumen and continuing economic diversification. But given the amount of French that I hear all over Lan Kwai Fong, I am certain that many more are surely not accounted for. Some 800 French companies keep offices here, using Hong Kong as their base to do business with Hong Kong and, through Hong Kong, with the Mainland of China and elsewhere in Asia. Hardly surprising, then, that the French Chamber of Commerce and Industry here is the largest European chamber in Hong Kong, counting more than 1,000 members. There is much that Hong Kong can learn from France - besides all the good things in life, there is also technology, aerospace, engineering and more. Much room for co-operation between us, given our decision to move ahead with a third runway for the Hong Kong International Airport. As Hong Kong continues to expand as an aviation hub, supporting aviation education and promoting offshore aircraft leasing, we look forward to more collaboration between Hong Kong and Airbus. 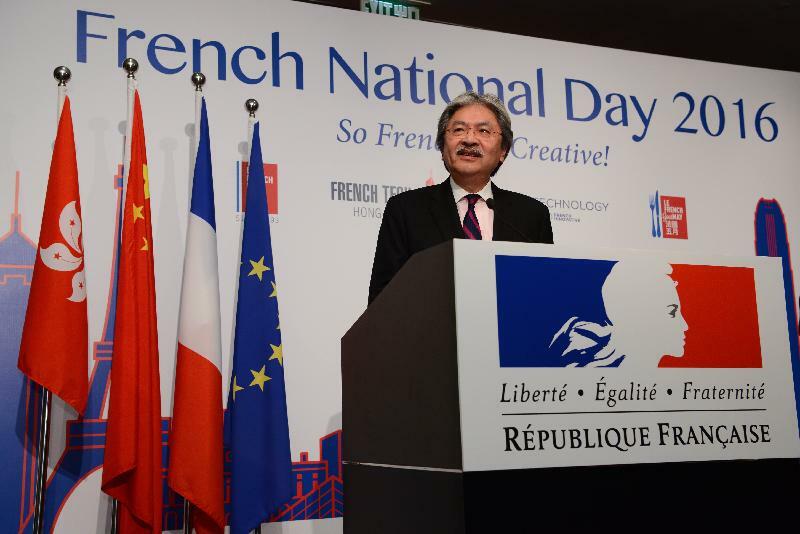 More broadly, our collaboration with France reflects our concerted drive to create a global centre for innovation and technology in Hong Kong. Indeed, I allocated some US$2.3 billion to innovation and technology in my Budget Speech earlier this year. That will only help fuel our I&T agenda, one that has gained considerable momentum thanks to our first-rate technology infrastructure, our world-class financial and professional services and our sound legal system. And that certainly includes our robust intellectual property protection regime. It helps, too, that our start-up scene is alive and thriving, with more than 1,600 companies from Hong Kong and from all over the world. That is up 50 per cent in just two years' time, and counts, I am pleased to note, French Tech Hong Kong, which set up office here earlier this year. In May, a delegation of start-ups from Bordeaux and Aquitaine visited Hong Kong, looking for local partners and investors, looking to take advantage of our buzzing start-up scene. They were joined by French Minister of State for Foreign Trade Matthias Fekl, who took up in Vinexpo, Asia's leading wine fair. I am sure that he was pleased with the Hong Kong show - particularly the show of French wine here and throughout Asia. France has been Hong Kong's top wine supplier for many years, last year accounting for more than 62 per cent of our total wine imports. That, by the way, was up 53 per cent over the previous year. No less important, our wine re-exports to the Mainland soared last year - up 87 per cent, year-on-year. That has a great deal to do with the unique arrangement of instant clearance that we have with the Mainland customs, as well as our well-known marketing experience, our branding expertise as well as business connections. May was also notable, here in Hong Kong, for Le French May, the annual festival of French arts and culture - and food and wine, too. They call it Le French May, though it dazzles right through June as well. Clearly, we can't get enough French culture here in Hong Kong. I would say that is a good reason for everybody now to join me in a toast: "To the people of the Republic of France."